Abstract: The Scythe Shogun weighs in a hefty 790 grams, and stands to a towering height of 147mm above the CPU. The Scythe Shogun is a large low noise heatsink built around a fairly recent heatpipe technologies. 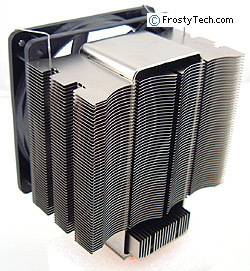 It works quietly enough to be a welcome replacement for computers using the stock Intel Pentium 4 or Athlon64 heatsinks, its large size and large fan efficiently move a large volume of air slowly through the many cooling fins. As quiet as the Scythe Shogun is, the heatsink is cursed by a set of mounting mechanisms that are complicated and unwieldy to install. The mounting plates rely on a bevy of flanges attached to brackets, with screws and fixtures that are frustrating to access in the cramped confines of a case. It should really take no more than a set of screws or snap clips, so it's an unfortunate predicament because the Scythe Shogun heatsink shows great promise at maintaining low operating temperatures with moderate noise levels. The Scythe Shogun weighs in a hefty 790 grams, and stands to a towering height of 147mm above the CPU. The heatsinks' 120x120mm hypro-bearing fan spins at between 700RPM-1600RPM, while producing at most 45.9 dBA in our real world tests. Socket 775/478 Intel Pentium 4 and socket 754/940/939 AMD Athlon64 processors are supported by this model. It does not AMD's socket AM2 processors, however. If you've been reading FrostyTech's heatsink reviews for a while now, you'll probably notice that the Scythe Shogun's appearance is a remarkably familiar one. The design of the Shogun heatsink is a continuation of the series first brought forth by TS Heatronics' NCU-1000, and then later by Scythe with the NCU-2000 heatsink. TS Heatronics is the Japanese company credited with inventing the Heatlane heatpipe, and heatsinks based on this technology are now sold commercially under the Scythe brand. 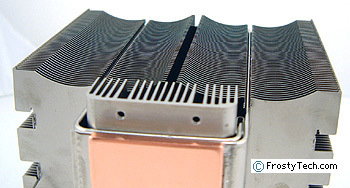 The flat loop of metal which connects the copper base to the cooling fins on the Scythe Shogun is what makes this heatsink tick, and it is the Heatlane heatpipe. The device was invented by Hisateru Akachi who called the device a "self-excited oscillation heatpipe." It is commonly referred to as the "Akachi pipe;" we'll explain how it all works in a moment. The Scythe Shogun heatsink comes disassembled, with a small box of parts that correspond to the different CPU mounting methods. The printed instructions come in handy when it's time to put everything together based on the type of processor it will be used with. The basic process involves attaching a box-shaped stainless steel bracket onto the base of the Scythe Shogun, or two flat plates depending on the orientation of the CPU socket, then specific tabs as necessary. 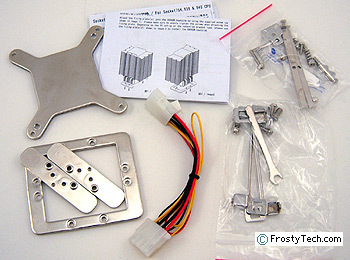 If the Scythe NCU-2000 is going to be used on an LGA775 Pentium 4 system, there are a couple brackets to install onto the motherboard as well... the instructions are clearly illustrated, but within the confines of a case it can quickly become tedious. Whatever the CPU, the manufacturer recommends that the Shogun heatsink be installed so hot air blows up towards the power supply, or towards the rear of the case if that is not possible. FrostyTech's K8 Test Methodology is outlined in detail here if you care to know what equipment is used, and the parameters under which the tests are conducted. Now let's move forward and take a closer look at the Scythe Shogun heatsink and the Akachi Heatlane technology, its acoustic characteristics, and of course it performance in the thermal tests!